Neil Armstrong, who on July 20, 1969 took the one small step for man and one giant leap for mankind, has passed away. He was 82. 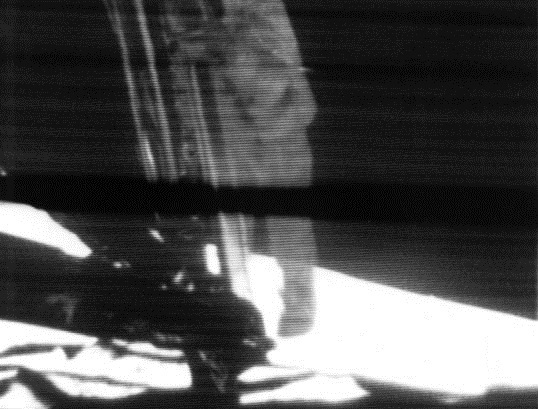 To understand how truly great that first walk on the moon was, you probably had to be there. Buzz Aldrin was right there in the Sea of Tranquility. Michael Collins kept watch from moon orbit. A roomful of nervous flight engineers listened and waited from Mission Control in Houston, Texas. I watched on television. I was 7. The moon landing took place in the afternoon, the moon walk that evening. I remember running home from the playground at West Sylvan School to our house on Walnut Lane in Portland, Oregon to watch the landing on black and white television. We sweated out the whole thing, from the launch, the moon landing, the takeoff from the moon, the redocking, the reentry, the splashdown, the recovery, and the quarantine. President Richard Nixon got into the act, stamping the Presidential Seal on the quarantine trailer aboard the USS Hornet. Don't judge Nixon too harshly, nary a President since hasn't got his picture took with the Apollo 11 crew. It is peculiarly American that we do not celebrate July 20 as a national holiday. The space race consumed over a decade and the attention of four U.S. Presidents (Eisenhower, Kennedy, Johnson, Nixon). We trailed the Soviets all the way, until the end, when we beat them. We were gracious in victory. Yes, on the six Apollo moon landings we planted the flag, played a few rounds of golf, and drove around in our LRVs. Buzz Aldrin even secretly took communion, free exercise of the First Amendment on the moon. And then there was Skylab and the final Apollo launch in July 1975 when we docked with the Soyuz and shook hands with the Soviets. No one was more gracious than Neil Armstrong, who claimed the achievement of walking on the moon for all mankind.